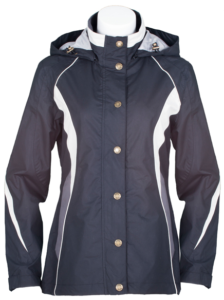 At this time of year, when the temperature seems to fluctuate hourly, with deluges starting seemingly out of nowhere, a really good lightweight totally waterproof jacket is an absolute must for the yard. Having endured jackets in the past that were supposed to be waterproof but were in fact at best some very optimistic version of ‘water resistant’ (i.e. turns into a disgustingly cold clinging sponge-like thing within 2 mins of a monsoon starting), I was determined to find a truly waterPROOF one, for starters. 3. be comfortable to ride in – not too tight on the hips when I’m in the saddle (Note: usually conflicts annoyingly with 2.) Zipped back vents do the job perfectly. and it’s quite a tall order to find something that ticks all those boxes. I’ve had the Toggi Element jacket to trial for months, and can safely say that it satisfies all my requirements, and is now my favourite Autumn/Spring jacket, perfect for wearing over a shirt on warm but changeable days, and over a shirt + bodywarmer on the cooler days. It’s available in Black or Navy, with the nice touch of contrast colour blocking. Highly recommended! 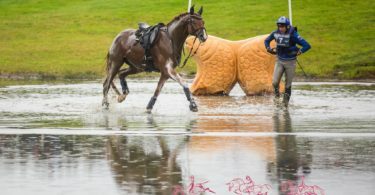 Eventing Safety – Do Riders Deserve Better?